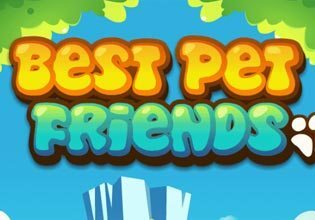 In the colorful match-3 game Best Pet Friends your task is to combine three or more cute pets of the same kind to free them. Okay, there is also a goal to achieve in each of the game's 40 levels. In order to succeed, you have to achieve a certain score, clean or free tiles from dirt, inedible mushrooms and other obstacles or to lead gems to the bottom of the level. The more pets you connect, the higher you will score and the more power-ups will appear to help you to achieve your goal. For successfully completed levels you will be rewarded with coins which you can use to buy additional power-ups, if a level proves to be too tricky for you. Show your heart for animals and play Best Pet Friends now for free!